Guys, I'm gonna be honest with you: after baking those citrus cornmeal cupcakes, I haven't come near my oven since. I'm still a little bit scarred by how much of massive downgrade my new oven is. The thought of baking a cake, or really, anything, just makes me a little bit depressed. Okay, technically, these are donut holes, I know, I know. Silly me decided that my donut cutter wasn't worth bringing to San Francisco, and decided to pack it away in storage back in Portland (what a mistake that was!). And here's something even worse that might actually disqualify these from National Donut Day — they're not even made with yeast. Hey! 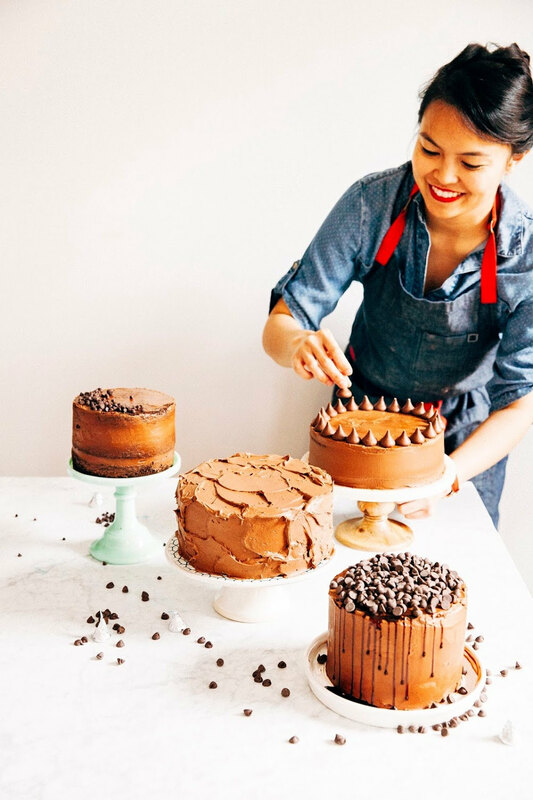 Cut me some slack — on the weekend I made these, I was headed to New York City for Saveur Magazine's Best Food Blog Awards ceremony. Ain't got no time to sit around and wait for yeast to rise, nope. So instead, I used a hacky, brilliant quickbread recipe from the deep annals of my recipe archive that yields buttermilk donut holes with a tender, open crumb and a crispy, golden exterior. And while each donut hole was still warm, I dunked them in a glaze made of healthy portions of local honey and St. Germain, an elderflower liqueur. If you haven't tasted elderflower before, I highly recommend it — elderflowers come from the same family as honeysuckle and have a wonderfully fruity, and almost lychee-like flavor. But be warned! There's a generous amount of St. Germain in the glaze, so these donuts would make for a boozy breakfast treat. Especially when paired with champagne. I may or may not be speaking from experience. And a big thanks to always lovely and adorable Melissa of The Faux Martha for rounding us fine blogging guys and gals up for National Donut Day. 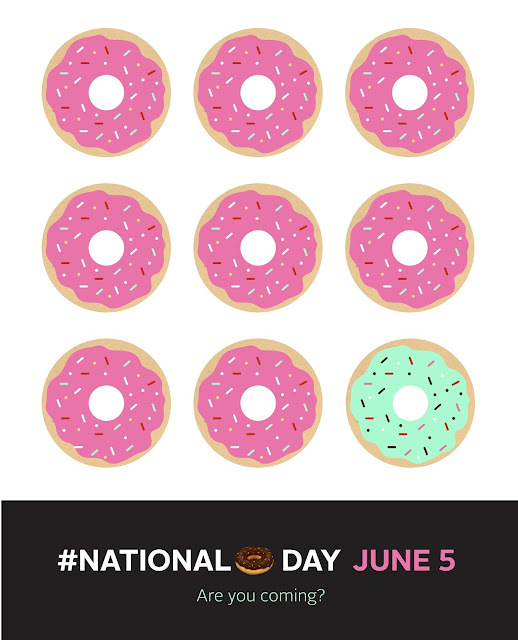 For more donut recipes, be sure to check out our National Donut Day site and the hashtag #nationaldonutday! Donuts are almost often made with a bread dough, which is usually risen with yeast. 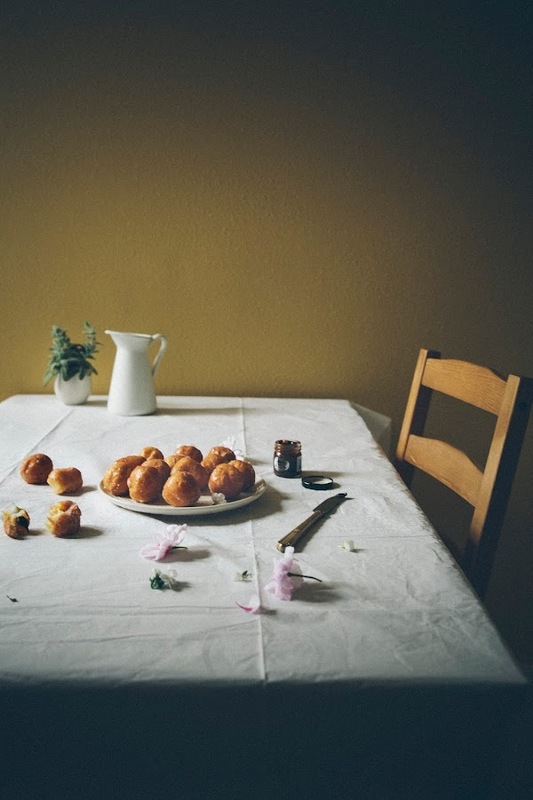 Quickbread recipes, on the other hand, usually aim to yield the same type of texture as a yeast-leavened good, but use baking powder or baking soda as a leavening agent instead. And while this recipe is awesome because it takes around 15 minutes to come together (as to my standby brioche donut recipe, in which the dough needs to be chilled for around 3 hours), it does mean that the donut holes go stale faster because quickbreads really don't keep as well as yeasted ones. These are best fresh and still warm from the fryer, and tend to get soggy and stale the longer they sit around. 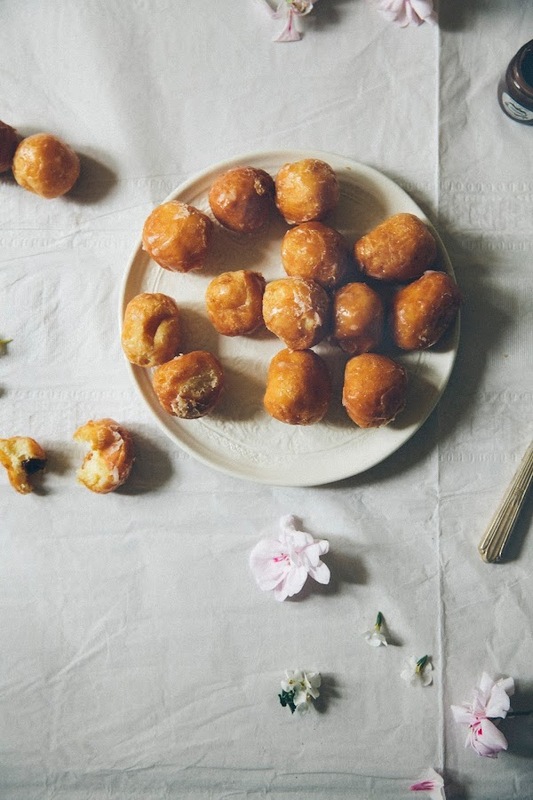 Remember that you don't need a deep fryer to make donuts. I actually have a deep fryer, but prefer to use a cast iron skillet to fry donuts since I feel like it's safer and easier to clean. Make sure your pot is deep enough to hold at least 2 inches of oil, with at least 2 inches of clearance from the top of the pot. You also don't really need a candy thermometer, but it makes your life a lot easier if you've got one. In a small bowl, whisk together 1 1/4 cups all-purpose flour, 2 teaspoons baking powder, and 1/4 teaspoon kosher salt. Set aside. In a medium mixing bowl, whisk together 1/4 cup whole milk, 1/4 cup buttermilk, 1/ cup granulated sugar, 3 tablespoons melted butter, and 1 teaspoon pure vanilla extract until just combined. Sprinkle the dry ingredients (from the 1st step) over the wet ingredients (from the 2nd step) and use a rubber spatula to fold the dry ingredients into the wet ingredients until just combined. Be careful not to overmix, or you will get dense, hard donut holes and I will cry for you! So don't be alarmed if the dough seems a little gummy and sticky — that's exactly what you want. Prepare your cast iron skillet/deep fryer and preheat the vegetable oil you'll be using for frying. Use a candy thermometer to monitor the oil's heat; once the oil reaches 350 (F), we're good to go! Use a 1 tablespoon-sized cookie scoop to measure out 1 tablespoon of dough. 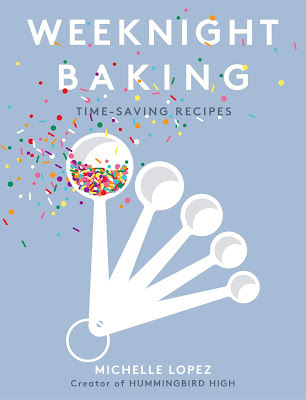 The cookie scoop should, by default, make a round shape so there's no need to roll the dough into balls (unless you are a stickler and want perfectly round donuts — but I didn't do any rolling and my balls turned out okay). Drop 3 or 4 dough balls into the pan containing the preheated oil. Fry until golden brown on the bottom, before using a spatula to flip each hole and cooking on its reverse side until golden brown. 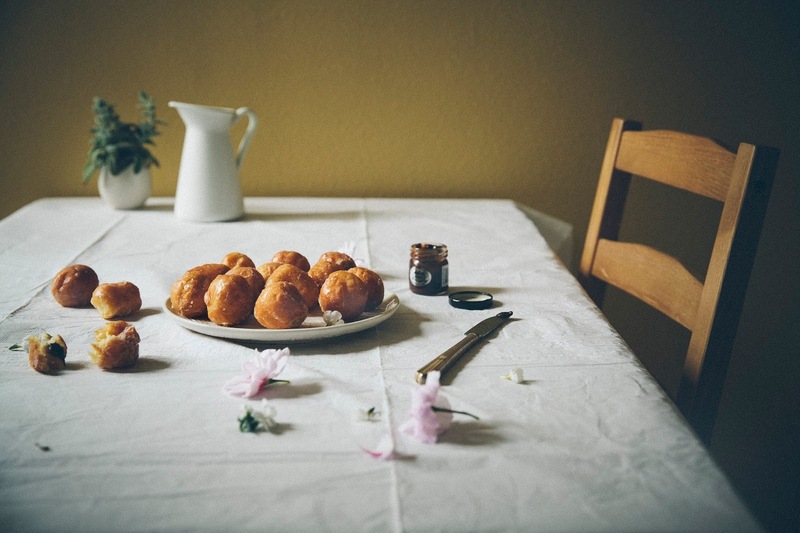 Once the donut holes are finished frying, carefully remove each with metal tongs or a slotted spoon and place on a wire rack lined with paper towels to absorb any excess oil. Repeat until all the dough has been used up. 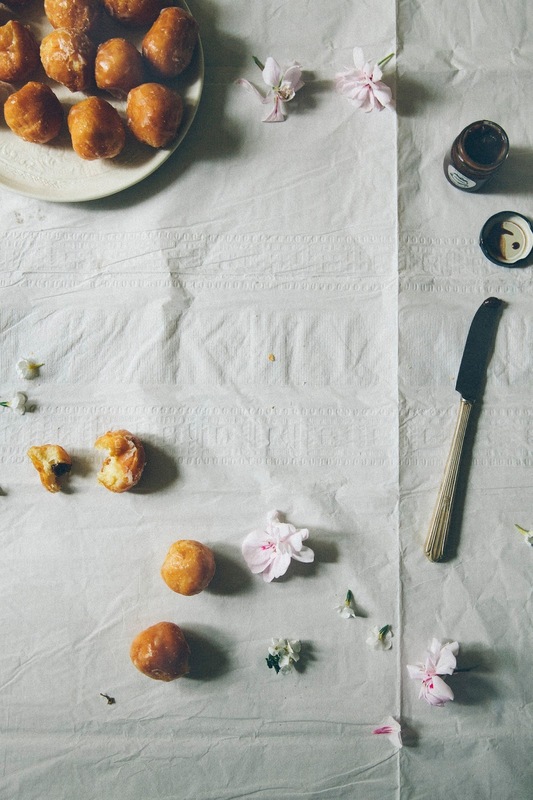 Once all the donut holes have been fried, quickly make the elderflower and honey glaze. In a medium bowl, combine 1 1/2 cups confectioners' sugar, 2 tablespoons St. Germain, 1 tablespoon honey, and 1 tablespoon milk by whisking together until you get a smooth, pourable glaze. Use a fork or a skewer to dunk each warm donut hole into the glaze, really giving the donut hole a good swirl in the bowl in order for it to catch as much glaze as it possibly can. Transfer to a wire rack placed over a baking sheet to catch any excess drippings, before enjoying immediately. Preferably with a glass of champagne. Love the photos in your new place, they look great. I really need to try out making donuts with buttermilk as well. I'm quite impatient and never do well having to wait for yeasted doughs to rise. A whole day dedicated to donuts sounds pretty fabulous to me. This recipe is AWESOME! Good luck on your move! I would be scatter to get thing together, let alone blog! They look delicious. Fluffy, interesting flavours and glazed; yum! Oh, so gorgeous! I LOVE elderflower. When I'm perusing a cocktail menu, if I see st germain elderflower in the list of ingredients, I will usually order it. Because they're so fragrant and yummy and light. I love that you used them in your donuts. Ah! 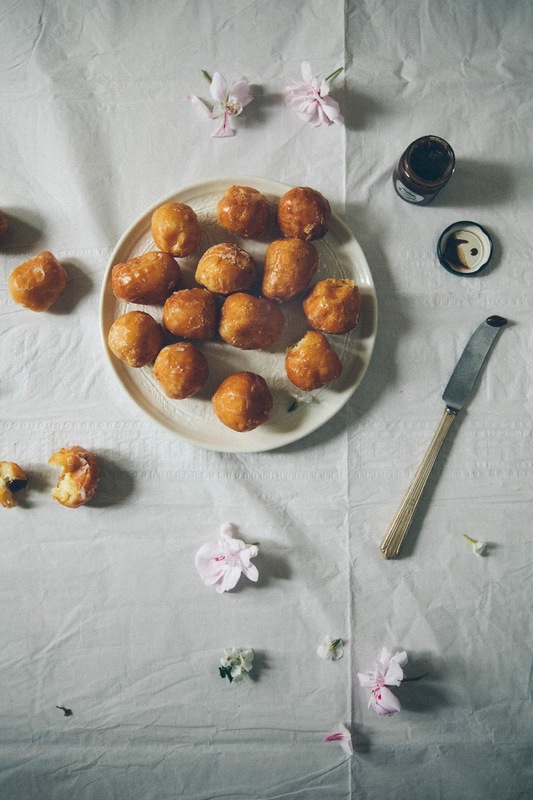 Totally in love with these dreamy donut hole photos. That St. Germain and honey glaze sounds bonkers ... I've been having a moment lately with St. Germain. These are soooo worthy of this weird food holiday. since its national celebration of donuts, i bought real deal donuts from a nearby store :) its been a sweet sweet morning. 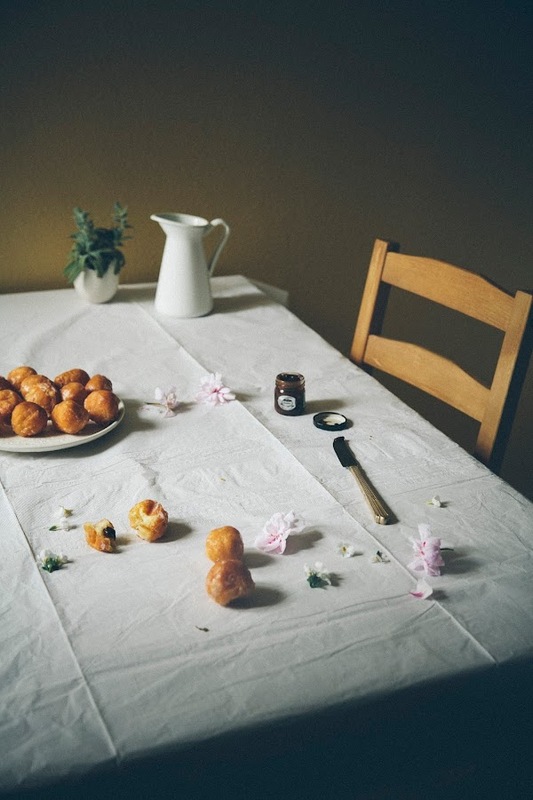 i love the idea of boozy breakfast. donuts!! they're always so swoon-worthy. last year there was a power surge and my oven got blown out and i had to wait a couple months to see if it could be fixed (it couldn't and i had to get a new one); i made lots of rice pudding and panna cotta, both of which were super comforting when i couldn't bake. Oh my goodness, Michelle. These. Photos. These photos!!! I didn't think your pictures could get any prettier but... they just did. Your styling is absolutely perfect. Man, I wish I had known about this day beforehand! I had no idea until…well, today. i guess I was too busy stalking the Saveur instagram account to see all the blog award happenings and wish that I was there! It looks like you and everyone else are having such a blast! It's just like high school when all the cool kids sat at a table together and it looked like so much fun. And there I was eating my lunch in the hallway. Thank you!!! I haven't really figured out the light yet, so I was worried that they'd be too dark, but I'm glad you like them! Thanks Sara! I usually think food holidays are kind of a joke, but donuts, ya know?! Thanks Cynthia!!! I'm still drooling over your malasadas. They look PERFECT. Congrats on your big win again!!! Thank you!!! I'm still trying to figure out the light and colors in my new place, so I was worried that these photos were too dark and moody... but I think I kinda like it! OMG your current oven is SLANTED! That is tragic, but also kind of hilarious at the same time. I haven't noticed anything on your blog though, everything you make looks absolutely perfect and delicious! Also LOL about your lifegoal. I love it. Yay, Dixya! Happy National Donut Day!!! Thanks Cindy!!! Your donuts looked good too, wish I was still in Portland so we could have done a donut swap! Yes! I'm thinking that this is the year of stovetop desserts like custards and puddings. Aw, thanks Abby! I'm still getting used to the new place, so I wasn't too sure if the lighting was too moody/grim. But I actually think it's starting to grow on me! I love your new profile picture, btw! You are GORGEOUS! boozey donuts!!! brb buying pants one size up. These are so dang pretty, and so are you - was such a treat getting to meet you!! Thanks Jessie! It was wonderful meeting you too!